This viewing, the sixth or seventh, I decided not to take notes, but to let the film wash over me, and the friend and friend of a friend who had shown up. The city as theater of memories — everything in its place upon the return to Tokyo. The film as art of memory — every sight and sound “placed” in an architecture of remembering, in which the recording device doubles and begins to erode unaided memory. Memory versus history: the personal wound against the onset of global oblivion. 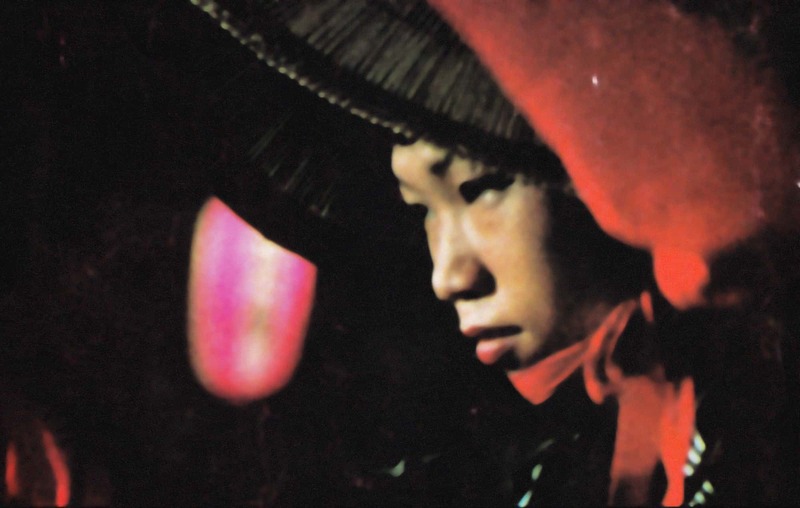 The protagonist, photographer, letter-writer, veiled self-portrait of Chris Marker, returns “home” to the 15,000,000 inhabitants of Tokyo: returning home to a huge, anonymous, and still familiar foreign city, rather than to the home, family, or nation of residence. Nomadic belonging substitutes for the “maison” as palace of memory. There is a transcendental homelessness to Sans Soleil, and it represents one of the most poignant aspects of this masterpiece, as expressed for instance in the two sequences from Iceland, one by Marker of three blond children walking on a country road, one filmed a year later by Harun Tazieff, footage of the volcano eruption which covers the town where Marker lived and filmed, and where his memory is entrapped. This whole science fiction speculation is accompanied by a suite of images of the city of San Francisco, Iceland, etc. and seems to offer a view from 4001, a selective fanning through time-images: “sheets of past,” as Deleuze phrases this ability of film narration. The music, the ebbs and flows of the montage, the sense of synchronicity which begins to surge as we enter further into the film — these facets of Sunless link directly, indirectly, and obliquely with La Jetée, Marker’s famous time-travel film of 1962. There is, in fact, a similar gap between scene one of Iceland and the volcanic reversal (history forgetting itself and leaving a wound, as the figure runs in another section of Sans Soleil) as exists between Marker’s two films — approximately twenty years. We see another filmic gap in the English version of Le Fond de l’air est rouge, Cat Without a Grin, which adds a new ending dialectically reflecting on the gap between 1977, the year of the completion of the first, and 1988, when the film was translated and re-edited for showing on British television. The same melancholy of the temporal gap and of memory’s associative reappraisal comes into play: akin to Benjamin’s concept of history from the present, a present which views micrologically that which is a prehistory of itself, but suffers a separation from it by the immense gravity of ruin, decay, collapse. This is the gap of the sunless world — a wound, or rather a constellation of wounds which infect the memory, and which find themselves occasionally transcribed into other media having lost none of their power. The image is perhaps fragmented, but salvaged by a word; words and images seek each other like two halves of a desiring equation, like one of the images of love in Plato’s Symposium. This formation is a kind of antidote to the agonistic portrayal of the components of the emblem, a portrayal which commands Lessing’s Laokoon, newspaper practice, and the pitfalls of a major slice of modern documentary film practice. La Jetée is even, as I see it this time, directly referred to in the section on Hitchcock’s Vertigo and San(s) Francisco. Kim Novak points to the tree calendar, to the death of a tree which transforms it into a kind of reference point for the relativity of perspective etched into both Marker films, a radical concept of time which offers us the prospect of its nonlinear traversal. Marker says: this scene occurs in Hitchcock’s film “and in another film.” The reference to La Jetée is quickly executed; in this, it points to a fundamental reduction of the self-portrait or authorial signature into interstitial moments which are nods, hints, brief unveilings within a greater obscurity of agency and self-reference. Like Benjamin, Marker finds it difficult to speak in the first person and often opts out of this scenario of direct communication; neither, however, reject the I; in fact, the whole work of construction, arrangement, composition, architectonics concurrently take on the signature and even aspects of a theoretical and sensual desire. One of the bases of this desire is the act of traversing, traveling, expanding the self through an immense and ongoing encounter with experience in the guise of material detail, which an exacting intelligence then goes over with the care of a painter. This travel is not metaphorical, but practiced, and it involves a literal descent into the archive, of two types: the dust of the library, and the fragments of memory. Both are types of time-travel, and trace the engravings of time, legible, half-legible, and illegible. It is no wonder that the dominant atmosphere in Benjamin and Marker is melancholia, the scent that of the collector wiping the dust off the foreign, and never returning home. Memory is a collection of images, and has been slowly externalized, into the apparatus of writing and recording, into the “electronic bible” which Sans Soleil evokes. “How did humans remember before they taped, filmed, photographed?” Marker asks himself this question as a veiled and retrospective autobiographical self-interrogation. The film, as memory itself, submits to the distortions of the fallible, and accedes to the colorized and abstracted images of Hayao’s Zone, “homage to Tarkovsky,” who in turn is revealed as a major presence in Marker’s spiritualization. The spiritual turn is brought out in the focus on ceremonies and in the commentary’s obsession with the partition between life and death. This strain of the film is akin on some levels to an orientalist discourse on Japan as other, but the clichés are couched in quotation marks, and the visual detail given minute attention. Essaistic conclusions are provisional; they brush at the truth but contain a good dose of humor, and offer many outlets, resonances, chain reactions of thought in their wake. They do not claim to solve the hermeneutic intricacies of the visual image, but can on the other hand go so far as to hint at the mystery of the conjoining of the ear and the eye. There are, in other words, moments of an intense and fervent meta-commentary in Sans Soleil; these moments are like epiphanies, and hit one unawares, always in or near to the gesture of self-effacement. The willingness to erase translates as a capacity for speed, for the blurred image which registers only subliminally in the sensory system of the spectator. Such indeed is the situation of the tourist, whose journey is from ignorance and groping, unseeing movement through a foreign social space, towards a secret knowledge of the place, a place such as Tokyo. Places abound in this film: one focus is the interstitial — shots in the beginning of Japanese asleep on a ferry are echoed by Tokyo commuters sleeping in the train. The story of transportation and the odd connections with the medium of film are told allegorically, in a tale of traveling, sleeping, dreaming, drifting off into imaginary worlds which are themselves like small films, pulling in as they do fragments of the experienced real, of television, of mythological image, comic, city street — all the phantasmagoria. This may be a “cinema of the real” but it is no longer strictly documentary; the real expands to enclose the irreal, imagined, hallucinated. Marker documents and then splices in his projection of the dreamstate barely hidden behind every appearance. But for him, to document is to already transform into a lived dream, to bring out the singular aspects of subjects and objects, and their perverse relations. The objects look back (“les objects m’aperçoivent”), as Klee said, and they also infiltrate every corner of the world. Department store steps are musical instruments, image and advertisement are everywhere. Marker finds in Tokyo a living cinema, a city on display constantly and basking in the proliferation of the image and the media landscape (as in a scene of a few poor men watching a huge bank of TV screens displaying a major sumo wrestling match). There is a surveillance of the viewer by Japanese television — the eyes of prostrate women look straight into ours. The gaze is male, and murderous — filming is murder, as it preserves but also kills memory, and Marker cannot circumnavigate desire in his filming — a visual adulation of women, in short, a voyeurism, suffuses the film. here is then the corresponding, earlier, shot of the women who skirts the camera with her eye as it is focused directly upon her for what might be taken as an uncomfortable length. Finally she gazes directly into the camera; this moment is clocked at 1/24 of a second, the length, as we are informed, of a single film frame. Marker’s veiled commentary takes this into a critique of the rule in filmmaking to avoid direct eye contact with the camera; Sans Soleil strives for the perpendicular focus on the human face — this occurs in the train sequence in a kind of eerie eavesdropping on the sleeping, still upright passengers, each of whose portraits is taken. (Photos of the same subject matter appear in Marker’s photoessay books Le Dépays and Staring Back). Magic which is to be filmed leaves the residue of an enigma beneath the surface of the visually recorded/transcribed. One of the roles of commentary in film-magic is to reveal what the image as such leaves obscure; montage can perform this same function because it enables a play of analogies or correspondences which serve to suggest and imply the beyond-the-visible. Such is the case with the train sequences of Sans Soleil in which Japanese passengers, having fallen asleep, are supplied in the montage with dream images spliced into shots of them with eyes closed, drifting off. This ultimate film resonates with Marker’s idea of the perfection of memory in the “magnetic Bible” of the future; together they provide an important moment of metaphysical auto-commentary: a limit situation which film as a memory system confronts, consisting of related notions of simultaneity, full memory, and the slippage of exhaustive documentation into dreamscape, cinema of the invisible, beyond the thin partition which separates life from death (as a related thematic of Marker’s discourse on Japan explores). Memory and forgetting are trails on a singular moebius strip which frustrates or undermines their differentiation, philosophic and cinematic. Marker translates this membrane, this lining, into one of the fils conducteurs (conducting threads) of Sans Soleil; it is not left intact, but found to be violated — the wound becomes the one survival, the one locus of continuity in history and memory, because the “progress” of each is seen to be a violent one. History and memory are nonetheless incompatible; the one is the wound of the other. The loss of individual life is figured multiply: in the quotation of a farewell letter of a kamikaze pilot who dreams of a free Japan and who confesses that his mission relegates him to becoming a machine (or man-machine), entirely expendable in the greater war — memory obliterated by history. There is also a key sequence of the death, or rather murder, of a giraffe, which forms one of the most painful moments of spectation; we hear the gunshot and see blood spurting from twin holes on either side of the giraffe’s long neck. We see it stumble and its legs give out, and are then witness to the vultures which descend on the helpless, awkward creature. Marker creates here a quite singular and personal version of Eisenstein’s symbolic film, with its layers of effects, its woven patterns of space and time, its conceptual basis. The homage to Eisenstein which opens Le Fond de l’air est rouge, in the form of an essay on the Odessa steps, returns here more structurally and more subtly, in the direction of what can only be described as a set of interrelated thematics with moments of climax in a symbol which condenses what has been seen or is to be seen in a knot, a nexus of intensity or metaphoric takeover. Africa and Japan are linked through visual and philosophic means, visually through sequences of public celebrations — Carnival in Bissau (borrowed footage), a parade/dance in Tokyo, Shinjuko youth culture dances, African women in a marketplace, a military medal awarding ceremony conducted by Amilcar Cabral, as well as diverse ceremonies of acknowledging and commemorating death. Apart from and before the giraffe, we are shown several dead animals in the sub-Sahara, laid out in what might have been a pond whose water has been absorbed and whose oval indentation in the earth is cracked, parched, the animal dead, dehydrated, and recorded mutely by the camera without commentary. There is a very similar scene in Trinh T. Minh-ha’s first film, Reassemblage. Both are filmic gateways to Africa, and attempts to transcend tourist (and even ethnographer) status. Marker’s essaistic technique of utilizing threaded association (or the fil conducteur, as he mentioned in person in connection with his film Le dernier Bolchevik — in which he tells the history of the Soviet Union through the story of filmmaker Alexander Medvedkin), is nowhere more evident than in the way he weaves various topics, themes, visual and musical combinations, which are cross-stitched, delay-echoed, textured. 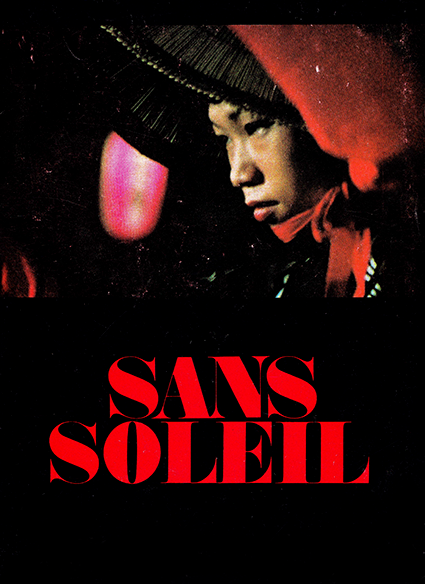 Sans Soleil is a film about animals, but also about political struggle; about memory and space-time travel, but also about Hitchcock, poverty, guerilla struggle, dreams . . . . Both spaces and times (past present and future) are woven together, and if the whole seems to contain notable sections and a segmented architectural plan, this model coexists with multiple strategies of erasure of the perpendicularity of the cut. Montage is put in the service of weaving, and this weaving is equally that of a fabric as of a magic spell or the multiple return of memories to the surface-screen of the mind. Part of this weaving evolves in the vein of self-portraiture, a reflection on the journey of the self and its senses through space and time (we are the “third worlders of time,” returning to the past with the gaze but also the ears of compassion). Each scene as it finds its place in the structure/texture of the whole marks a lived moment — lived but mediated by the recording apparatus, and thus perhaps not fully lived but rather cut off by the intervention of the machine between the sense-body and the exterior. The final film effects perhaps a redress of the transgressions of this mediation — of the intrusions of film recording between the subject and the world, and of the appropriation of individual subjects through eavesdropping, surveillance, imperialist salvation. This redress takes place within a melancholic, confessional discourse which is simultaneously one of erasure and self-erasure. The “Zone” images abundantly attest to a kind of will to erasure of the real through technological transformation. It is as if the distortion of form, color, sequence, and (not least, as we will see) sound, delineate a response of fatalism — pushing to the limit of a tendency, instead of backing away from the its consequences toward a previous, less mediated stage. Technology, far from abandoned, is launched into the imaginary, and begins interpretation again from the perspective of an artificial intelligence. One of the moments of the self-portrait here is in the subtle return to La Jetée, Marker’s film of 1962. Twenty years later this film finds its Aufhebung, its preservation and destruction, memorization and active forgetting. In between, Marker’s nomadic itinerary has taken him all over the world, and he has become indeed the character of the earlier film, “projected” through the temporal-spatial continuum. Sans Soleil is a reprise also of the political themes of Le Fond de l’air est rouge, whose discourse revolves around struggle — armed, ideological, discursive, and of class and gender. This palinodic aspect makes of the later film a kind of sequel, but one in a different mood or modality, with what one might categorize as the subjective underside of events in the “objective” political and technological world which Le Fond de l’air revolved around. In fact it would be useful to compare in detail these differences in perspective, mood or modality in order to pinpoint the mutation of documentary into essay filmmaking with its higher quotient of self-portraiture, allegory and the de-realization of the real. He goes on to speak of the politicization of students, peasants, and workers in the 1960s, and to note that the sense of community formed through the movements transcends the failure of their explicit goals. Marker pinpoints the paradox of success and failure whose mediating and transcending term is experience; experience can be relegated to neither of these categories but draws of necessity from both of them. Experience is the category of the wit and atmosphere of Sans Soleil: irony and cynicism tempered with knowledge, poetry and compassion. Both extremes seem to proliferate exponentially and even fuel each other, taking on the aura of a method, a hermeneutic, a way of looking through a kind of filter which doubles the mediating, intervening role of the recording apparatus. What melancholy, cynicism and compassion have in common is a departure from the evidence of the real, from the acceptation of the bloß Seiende (“merely existing”) which is the epistemological common denominator of superficial “objective” forms of documentary. Here the essay film again departs markedly from this implicit standard. To pursue “critical documentary” is not enough; nor was it apparently an end in itself for Marker to film strikes and workers’ struggles in the sixties or, as the founding member of S.L.O.N. (Société pour le lancement des oeuvres nouvelles, but also the Russian word for elephant), to hand over the equipment to these workers themselves so that they could make their own images of struggle and protest. Marker returns in the post-S.L.O.N. period (with his new company ISKRA) to a profound irony which his earliest films had known. Lettre de Sibérie, for example, exploits the humorous and ideological possibilities of the renowned Kuleshov effect by showing how the documentary image, in its virginal, soundless state, contained a myriad of possible elaborations/distortions, effected by its radical ambiguity and by its possible interfaces with commentary. Commentary often takes the form of the joke in Marker, but his humor is not without a sly compassion, as Sans Soleil makes abundantly clear. In his irreverence and wealth of knowledge and cultural reference (Henri Michaux was once quoted as stating: “Ecraser la Sorbonne, et mettre Marker à la place.” — “Tear down the Sorbonne, and put Marker in its place.”), Marker recalls two other contemporary filmmakers — Godard and Kluge. The works of all three are informed and traversed by Marxist discourse, but never to the point of an orthodox, hard-lined ideology which has purged all humor from its critical gaze at the real. Instead, the imaginary and the phantasmagoric facets of the real come to the fore and are drawn out by the paradoxes which spring from the dialectical and proximate potencies of the meeting of word and image.